Enlarge/ An employee working for the manufacturer of solar batteries, Sonnen GmbH, in the Bavarian village of Wildpoldsried in southern Germany is pictured on July 5, 2016. In September, South Australia confirmed a plan to set up an AU$100 million (USD $72 million) fund to help households purchase home energy storage batteries. Households could receive subsidies of up to AU$6,000 (USD $4,300) on a purchase of a battery that would store electricity either from a solar-panel system or from the South Australian grid. The electricity could then be used during an emergency or a blackout. After a year as the home of the world’s largest grid-tied battery (built by Tesla), South Australia is becoming a hub for battery investment. Other, non-Tesla battery makers are taking note. 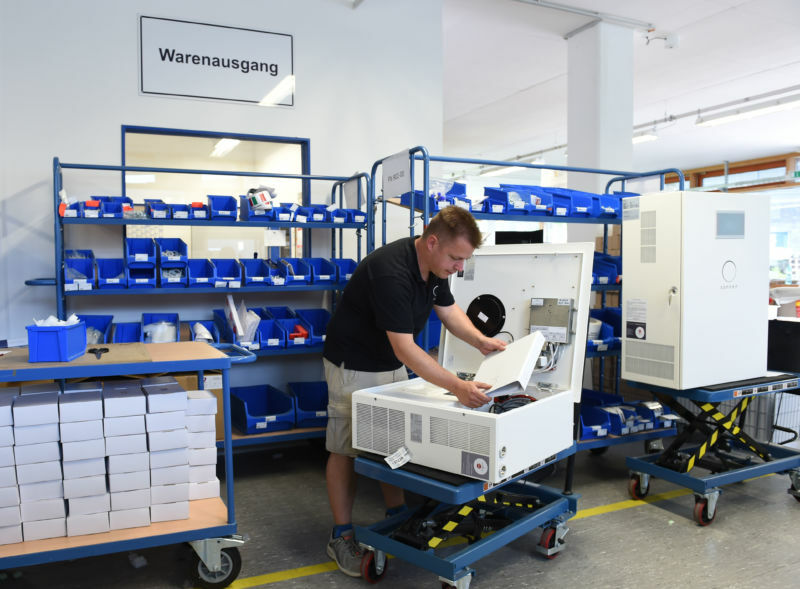 This week, German battery maker Sonnen started producing batteries at an old GM Holden factory in Elizabeth, South Australia. Sonnen has long experience in the home energy storage market, deploying batteries for German households before Tesla announced its Powerwall. Now, it intends to use its Elizabeth factory to produce batteries not only for South Australians who hope to take advantage of the government’s new subsidies but also to ship home storage batteries to other places in the Asia market, according to PV Magazine. The premier has pushed for his AU$100 million battery subsidy since taking office in early 2018, seemingly to the exclusion of a “virtual power plant” idea that had been pitched by Tesla and accepted by the previous premier of the state. Marshall’s plan aims to help 40,000 South Australia homes purchase a battery, which need not be from any one battery maker. Accordingly, Sonnen isn’t the only battery maker ready to call South Australia home. According to PV Magazine, “China-headquartered battery manufacturer Alpha-ESS announced plans to set up a manufacturing facility in Adelaide” just this month. That facility is expected to churn out 8,000 batteries a year and create up to 120 jobs. Additionally, “Canadian battery manufacturer Eguana Technologies announced it would invest $12 million in South Australia’s booming battery sector and manufacture its Evolve home energy storage system in Adelaide,” PV Magazine wrote. This is expected to create up to 200 new jobs over three years.